Go Where Traditional Advertising Mediums Aren’t Available! Sometimes there isn’t traditional billboard space available, the advertising medium is too pricey, or there isn’t time available to meet your needs. We can deliver you message where others can’t and we’ll do it cost effectively. 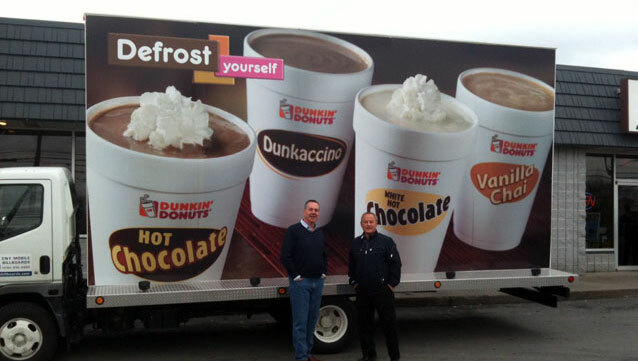 Mobile billboards are the new way to attract people to a venue or the offering you are making! We are mobile and the truck is lower and closer to the consumer compared to static billboards. The profile is viewed more easily and retained. Even if the mobile billboard is parked, there is a higher recall because it right in the consumers line of sight. Static billboards are usually high in the sky and a hundred yards off the road often on high speed highways. Our Mobile billboard truck can be deployed at the largest traffic intersections in the area as well as SU games, shopping centers, high school sporting events or any large gathering of people in any area. We all know the draw at SU games from all across the state. We can easily expect at one SU Basketball game to be seen by over twenty thousand people. Compared to traditional media, mobile advertising has the lowest cost per impression. For the cost of one full page ad in a newspaper you can have a billboard for a month! Mobile rates are the fraction of the cost of TV or radio and substantially lower than a static billboard. We have flexible options to meet your needs and budget. Daily, weekly, monthly or longer-term contract periods are available. Mobile billboards provide the ability to design custom routes that enable your advertising campaign to target specific locations and reach peak traffic intervals at different locations depending on the time of the day. Mobile billboards are viewed by 95% of people with a 91% recall rate. They also generate 2.5 times more than a static billboard. Mobile billboards can’t be turned off, fast forwarded, thrown out or ignored. Newspaper readership is down. Television is very expensive and DVRs allow people to fast forward through commercials. Radio listener ship is often a broad spectrum of listeners and with digital radio such as SIRUS there are not commercials. Mobile ads can go where your audience is with a high retention rate.